WCF stands for Windows Communication Foundation, introduced by Microsoft. WCF is one of the popular technology to build Service-Oriented Systems. WCF is the unified model for all existing distributed technologies by Microsoft such as ASMX Web Service,.Net Remoting. WCF supports HTTP, TCP, MSMQ and other protocol as well to communicate. 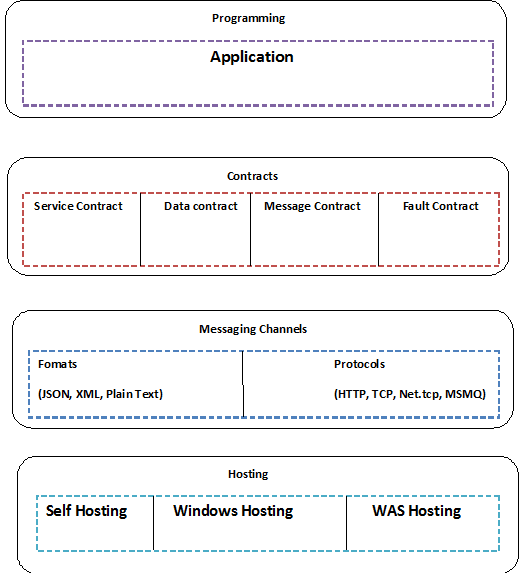 Following image explains the major components of WCF from hosting to programming. We will see each one of WCF component one by one in upcoming blogs. In coming blog, I will explain about ABC of WCF.